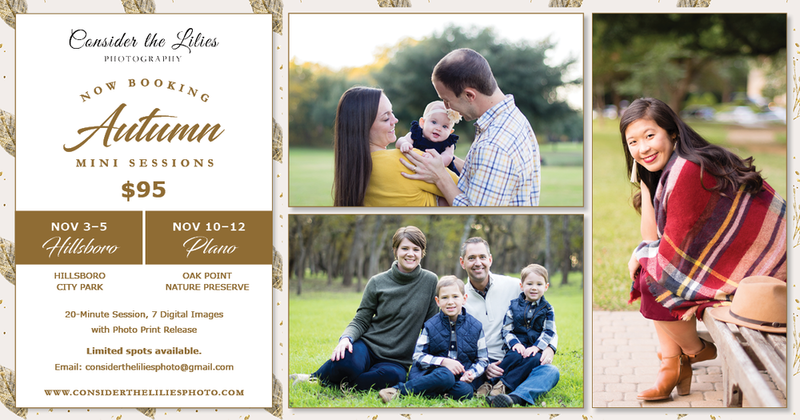 Now booking a limited number of Autumn Mini Sessions – perfect for updating your annual family portrait and for holiday cards or gifts! Not sure if you should book a Mini Session or a full portrait session? Check out my blog post "What to Expect with Mini Sessions". Because Mini Sessions are available on a limited basis, all Mini Session bookings are final and non-refundable. They cannot be rescheduled to a new date or time (*except in the case of bad weather). If you are unable to attend your Mini Session, you are welcome to gift or re-sell it to a friend or family member. *In the event of bad weather, photo sessions will be moved to a different date. Pricing and availability is subject to change.